EIROforum DG Autumn Assembly 2018, ITER Organization, France. From left to right: Frederic Le Pimpec (XFEL), Renata Witsch (ESRF), Martin Walter (ILL), Plamena Markova (EMBL), Silke Schuhmacher (EMBL), Robert Feidenhans’l (XFEL), Xavier Barcons (ESO), Claudie Haigneré (ESA), Bernard Bigot (ITER), Fabiola Gianotti (CERN), Mark Johnson (ILL), Günter Hasinger (ESA), Tony Donné (EUROfusion), Johannes Schwemmer (EUROfusion – F4E), Svet Stavrev (CERN), Francesco Sette (ESRF), Duarte Borba (EUROfusion), Mark McCaughrean (ESA). EIROforum’s Directors-General (DG) Assemblies take place twice a year. The spring Assembly is usually held in Brussels, Belgium, and includes high-level meetings with the European Commission to discuss science policy issues. In autumn, the Council convenes at one of the member organisations’ sites. 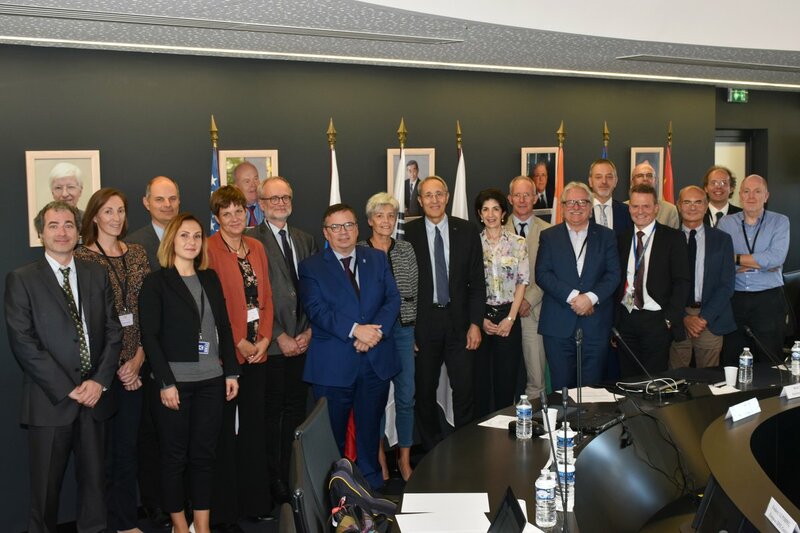 The 2018 Autumn DG meeting was held on the premises of the ITER Organization under the chairmanship of EUROfusion Programme Manager Tony Donné. 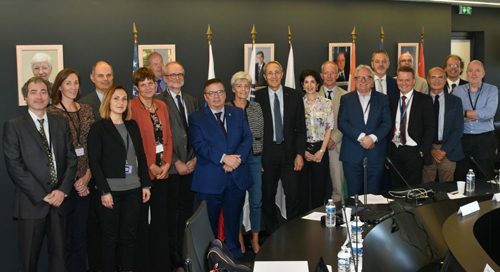 ITER, the biggest experiment currently being built in the South of France is the focal point of research undertaken in 30 research organisations belonging to the EUROfusion Consortium.